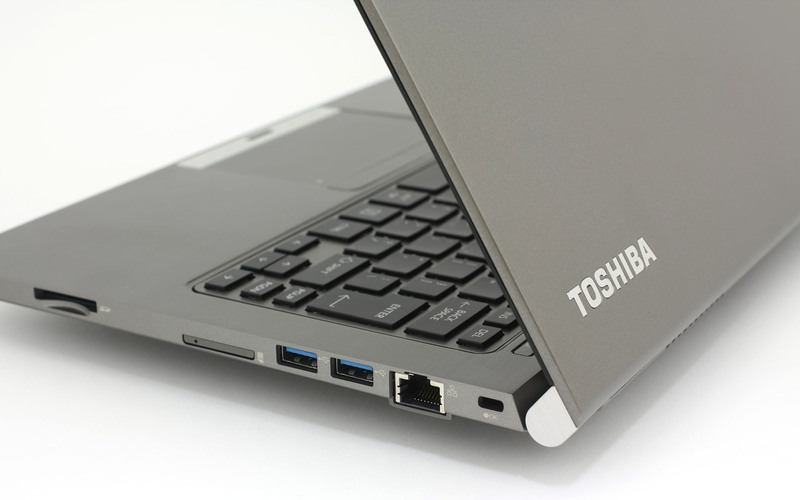 It’s time to review another Toshiba device, but this time from the more premium class and more business-oriented – the Portege Z30-A. This lightweight, compact and durable business companion has some intriguing qualities which will appeal to most of the travelers out there. You can tell this notebook at first sight that it’s made to last and it’s always ready for business. Nonetheless, this ultrabook proves to be a really good multimedia companion and you will see why in the display section below. However, we did notice something really odd by looking at the specs sheet. It’s a refreshed 2015 model, but strangely, offers a relatively outdated hardware. Unlike most competitors, the Japanese vendor chose to separate the regions by offering a Haswell “U” series CPUs to some and Broadwell generation processors to most. That being said, we arrive at our first complaint – the CPU. While this might not apply to most markets, there currently several stuck with the Haswell generation CPUs which isn’t easy to pass by. We will still assess the rest of the features and it might turn out a good buy no matter the region. 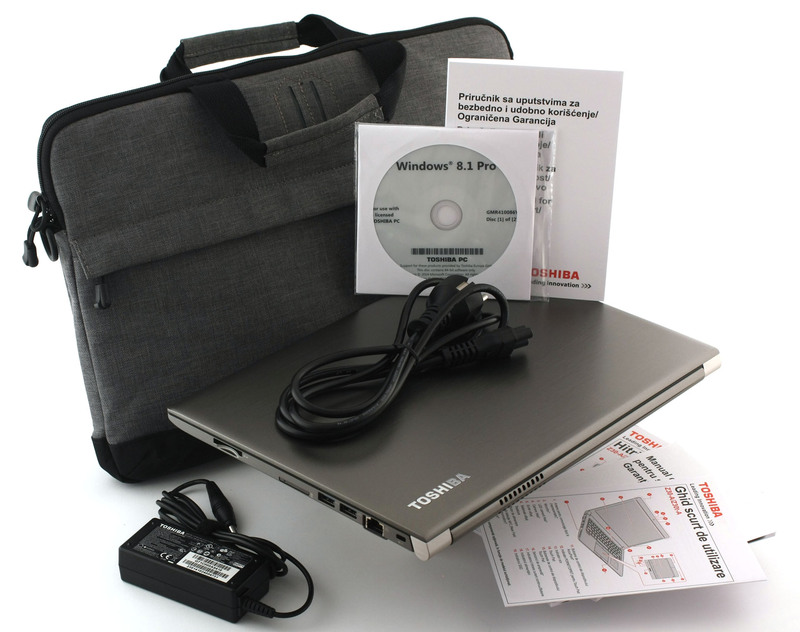 Inside the box can be found several user manuals, AC charger and cable along with two DVDs – with one containing the drivers and the other a licensed version of Windows 8.1 Pro as notebook comes with Windows 7 pre-installed. Oh, and not to mention the cool bag that comes with the notebook. 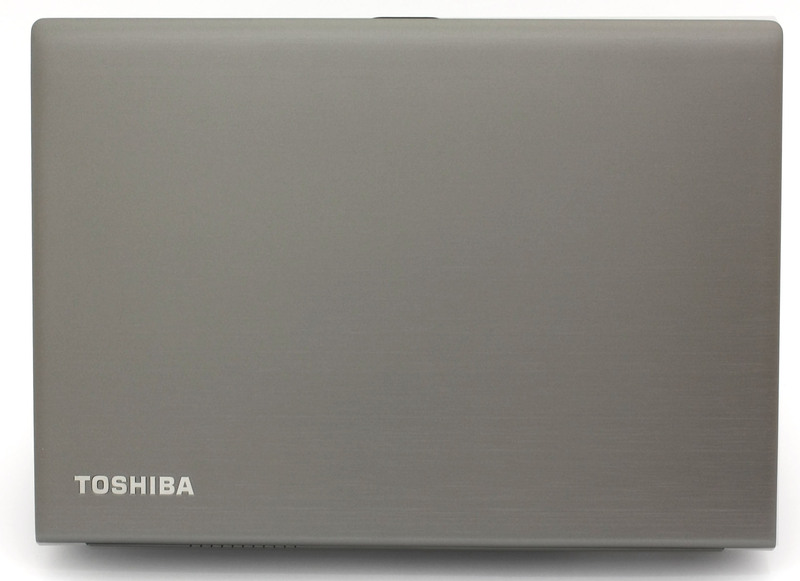 Toshiba claims that this tiny notebook is made to survive a big abuse, despite the fact that it weighs just 1.2 kg. To be honest, the ultrabook does seem to be pretty sturdy and tight. When you pick up the device you get the impression of packed, well-balanced device that weighs just enough to make a presence. Let’s begin with the lid that’s made of polycarbonate imitating brushed aluminum pretty successfully – it’s cold to touch and it definitely looks like the real deal. Nevertheless, due to the plastic construction the cover bends a little, but nothing too worrying. Opening the lid, you will see the usual built-in webcam, microphone, Toshiba’s logo at the bottom and, of course, the 13.3-inch FHD display. Speaking of which, we are happy to see a Toshiba device without the huge bezels, because the one presented here are relatively thin. Going around the bottom, the situation practically stays the same, just this time without the brushed-like ornaments. There’s a connector for the docking station that can be bought separately. Near the back of the machine is placed the main heat dispersing grill and another vent next to it that can be used with an external cooling pad. 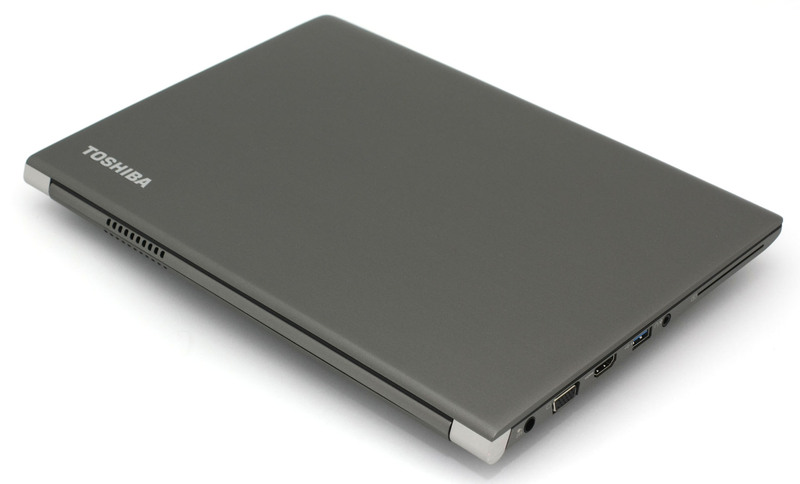 The sides of the laptop are quite thin and become slimmer at the front – 17.9 – 13.9 mm. Yet, all the needed full-sized ports are in place. The left side accommodates the DC charging port, one VGA, one HDMI, one USB 3.0 port, and a 3.5 mm jack for headphones. Right next to the 3.5 mm jack is located one of the card reader slots. 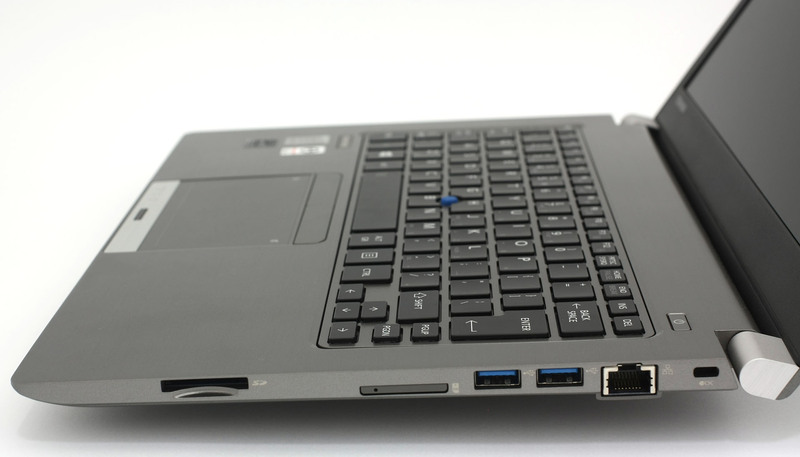 The right side has a LAN with two USB 3.0 ports along with the second card reader and most importantly – the SIM slot as the notebook supports 3G connectivity. We must say, Toshiba has really upped the game with all these useful ports and connectivity options at this price range. Going inside the interior, the same design signature and feel – strict, minimalistic, elegant. The main plate is made of brushed aluminum this time – definitely sturdier and colder. Looking at the keyboard and there’s something wrong with it. The keys appear to be a tad smaller than they should be. They are wide enough, but their width is somehow insufficient and someone with bigger fingers will definitely feel it. Nevertheless, they provide long and tactile feedback and don’t appear to be stiff like some keyboards we’ve tested in the past. The keyboard for sure is comfortable, but takes some time to adjust to the size. When we first started using the notebook we’ve miss-pressed keys quite often. Now we are going to talk about input devices and ease of navigation. The trackpoint in the center of the keyboard feels somehow awkward and extremely unpleasant to touch. It’s really rough and even gave us goosebumps just by touching it. Despite that, the mouse buttons are conveniently placed and make a pleasant “clicky” sound. 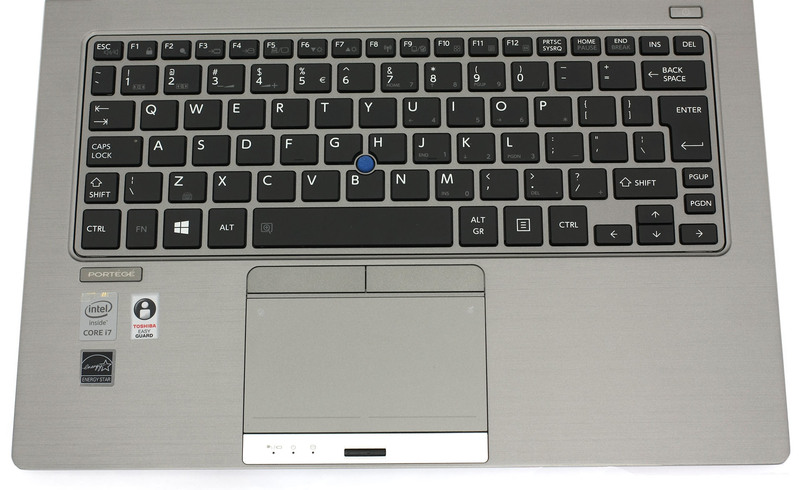 The touchpad is also easy to use, it’s responsive and supports one finger vertical and horizontal as well as multiple finger gestures (even in Windows 7). Right under the touchpad you will see the status LED lights and the fingerprint scanner for a better protection of your personal data. To sum things up, we are happy with the design and build quality of the device. Even though the main material here is polycarbonate, it doesn’t leave the all well-known “cheap feeling”. Moreover, the Portege Z30-A feels elegant and it’s really lightweight making it perfect for traveling companion. 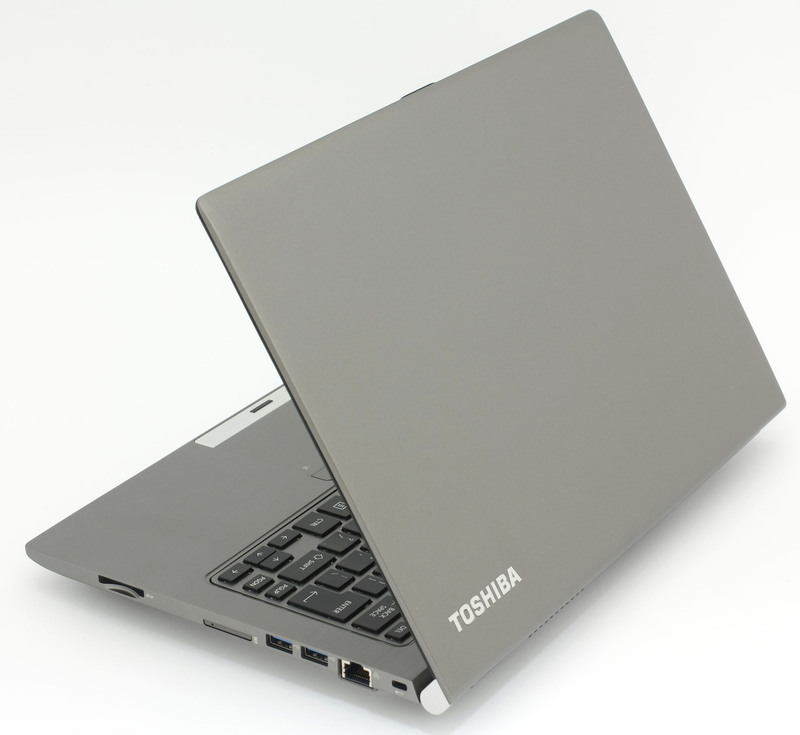 Besides that, Toshiba claims that the notebook is life-proof because of the magnesium inner chassis and aluminum hinges so it will sustain minor to medium drops as well as 30 ml spilled drink on the keyboard. The Portege Z30 sports 13.3-inch Full HD IPS panel with a resolution of 1920 x 1080 pixels which means that the pixel density of the display is 166 PPI (pixels per inch) and space between each pixel – 0.1534 x 0.1534 mm. The panel becomes “Retina” when viewed from a distance equal to or greater than 53 cm. Here’s the image quality when the panel is viewed from a 45-degree angle. The maximum brightness we were able to record is 338 cd/m2 with a deviation of 13%. The native color temperature is 6319K which is really close to the optimal one – 6500K (D65). There’s no unacceptable deviation of the temperature on the surface. The panel covers 96% of the sRGB and 76% of the Adobe RGB color gamut. Almost all Web-based colors will be reproduced. The tone response curve is 2.3, again close to the optimal one of 2.2. We’ve calibrated the display at 120 cd/m2 brightness with two different calibrators – X-Rite i1DisplayPro and Datacolor Spyder4Elite. The contrast ratio is high – 1000:1. The color accuracy is off the charts – DeltaE(2000) = 0.48 – this is almost perfect result meaning you can’t tell the difference between the sample and the reproduced color without the proper lab equipment. Before we repeat the calibration, we’ve measured the DeltaE with the stock profile and it turns out that the display is good for professional photo editing or design without the need of additional calibration. After the second calibration colors appear to be even more accurate. You can see the result on the color map below. We’ve recorded PWM (screen flickering) only at 25% image brightness and below. The luminance of the display at this level is 85 cd/m2 in which case the display is rather useless. The only environment suitable for this brightness level is pitch black room. We can consider the panel user-friendly and harmless to your vision. We recorded the refresh time of the pixels from black to white and white to black for 10 to 90%. So we were able to measure Fall Time + Rise Time = 27 ms, which is more than three times the response time a TN panel would reach. But the TN panel cannot be compared to an IPS panel in terms of image quality. Toshiba Portege Z30’s display has a high pixel density due to the small diagonal and high resolution as well as high color gamut coverage. Furthermore, the color accuracy of the display is suitable for professional use and the backlight of the panel is harmless to your eyes above 25% brightness. For such a small and thin device, it’s logical to assume that the provided battery isn’t shining with great capacity. 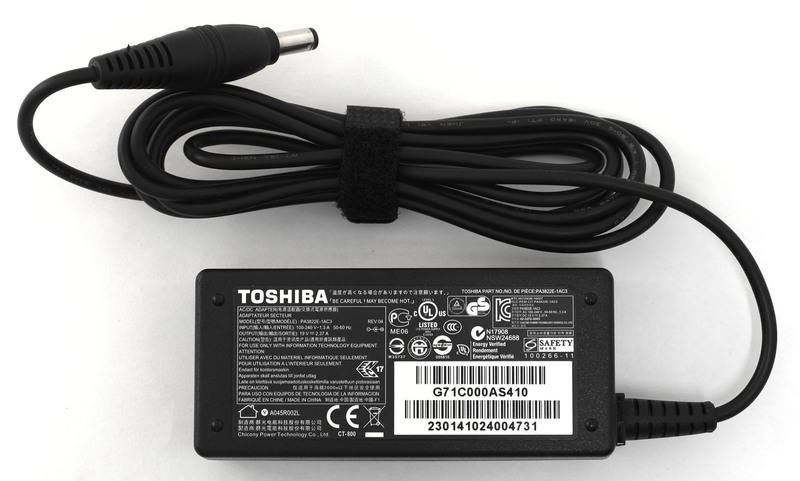 The one running the show here is manufactured by Toshiba rated at 52Wh or 3380 mAh. Will it be enough to power the device? It turns out that the battery performance somehow underwhelming. 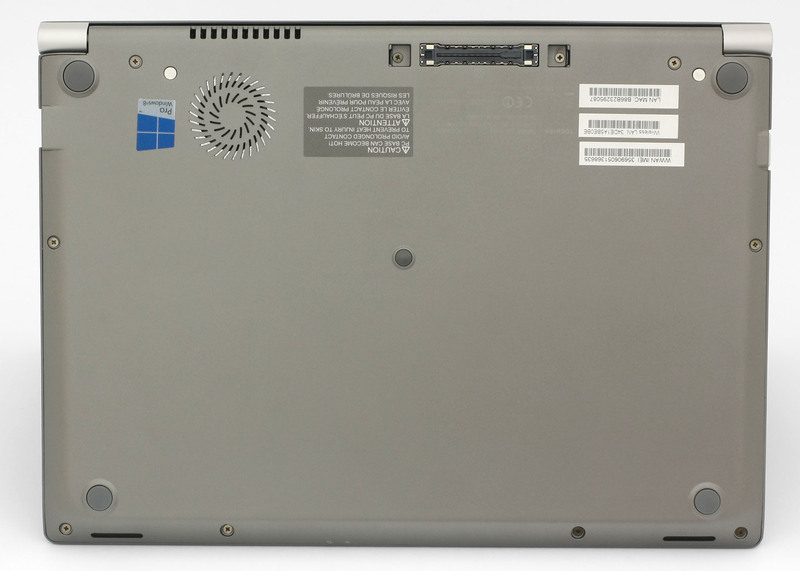 We were actually expecting more from a business-class notebook like this one. You can see the results from our usual web surfing, video playback and gaming tests below. Keep in mind that all tests were run under the same conditions – Wi-Fi turned on, Bluetooth off, power saver on, and screen brightness set to 120 cd/m2. We expected better battery performance – 350 minutes (5 hours and 50 minutes). Another underwhelming result – 292 minutes (4 hours and 52 minutes). Quite surprisingly, the notebook endured the most demanding battery test for quite some time – 214 minutes (3 hours and 34 minutes). This is rather unusual and we would have been happier if web browsing and video playback scores were better than gaming. Intel HD Graphics 4400 is an integrated, GT2 graphics controller in the Core i-series of processors from Intel’s Haswell generation. Announced on June 5, 2013, its goal being to successfully fend off the low-end dedicated memory graphics by AMD and NVIDIA. HD 4400 has 20 ‘Execution unit’ blocks, four more than the HD 4000’s sixteen blocks. The graphics chip supports DirectX 11.1, Pixel Shader 5.0, OpenCL 1.2, OpenGL 4.0, a Quick Sync encoder and a similar 4K video decoder. Intel HD 4400’s base frequency is 200MHz, but Turbo Boost can increase it up to 1110MHz, depending on the processor in which the 4400 is integrated. HD 4400 supports up to three individual displays with a max resolution of 4096×4086. Power consumption is lower when compared to NVIDIA and AMD’s discreet solutions, which is why integrated GT2 controllers are a must-have for the Ultrabook class of portables. We’ve run the usual CPU and GPU stress tests to see how the system handles higher loads and extra heat. We start off with a simple CPU stress test and see if any throttling occurs. The normal operating temperature of the CPU is around 43-45°C, but after turning on the CPU stress test, temperatures rose to 74-75°C maintaining 2.6-2.7GHz of operating frequency. For the record, the maximum operating frequency of the CPU is 3.0GHz with one active core and 2.8GHz for two active cores. That being said, we can rate the performance of the CPU very high as it didn’t even come close to the 2.0GHz base frequency mark. Unfortunately, though, this sometimes comes at a price and this time it’s the fan. While this small fan works just fine keeping the internals cool, it is ridiculously loud. Actually, it’s so loud that even gaming notebooks make a small buzzing sound compared to this one. 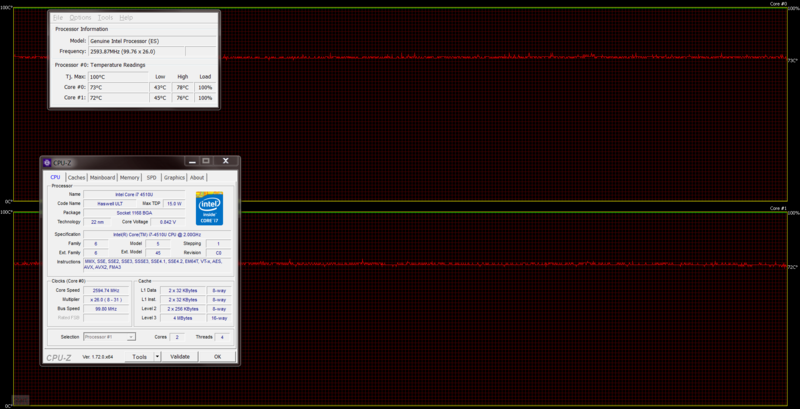 Even when performing light tasks the CPU fan makes a high pitch buzzing sound that may annoy some of you. You can see the results from the test on the graph below – red line for temperatures and green line for CPU load. After more than an hour, we started the GPU stress test alongside the CPU test to see if temperatures rise a bit and if there’s any performance drop. Unfortunately, just the thing we’ve expected – the CPU started ticking at 1.1GHz and this is due to the extra CPU and GPU load on the SoC. It’s also important to say that most of the ultrabooks we’ve tested had this same performance issue, but it’s necessary to keep your internals safe. However, these conditions are quite unlikely to be reproduced in real-life situations, but we perform these sorts of tests to check the overall stability of the system in the long run. We’ve also checked how the inner temperatures affect user experience and you can see on the heat map below that the only hot spot is where the CPU is located. The area where palms rest and the entire surface on and around the keyboard remains cool so we can give a positive score of the cooling system. Quite frankly, one of the best cooling system on an ultrabook so far, despite the extremely noisy fan. Compact, lightweight and capable business solution. This notebook impressed us with its sturdy and strict construction while keeping the weight low (1.2 kg). Despite the main polycarbonate body, the inner magnesium frame should be secure enough for light to medium drops as well as enough reliability during travels. The design is minimalistic, somehow strict and offers a thin profile with all of the desired full-sized ports like VGA, HDMI, LAN, SD card reader and more. 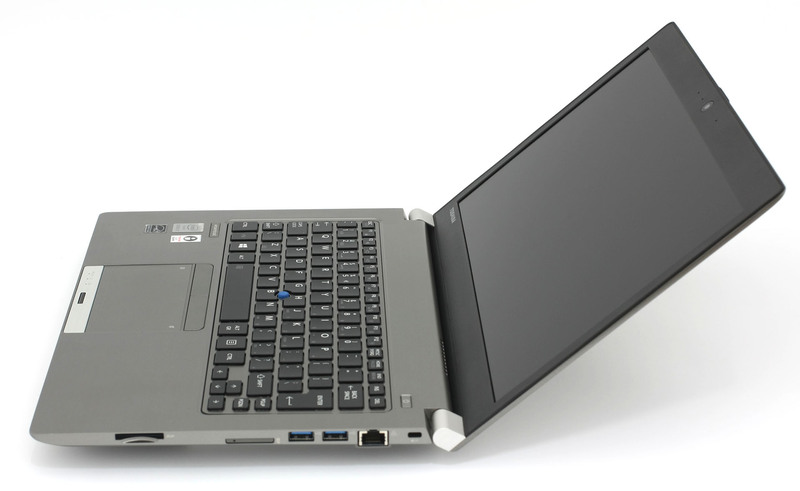 This way it will be compatible with most hardware that users have and most importantly – the notebook supports 3G connectivity as well as fingerprint data protection. 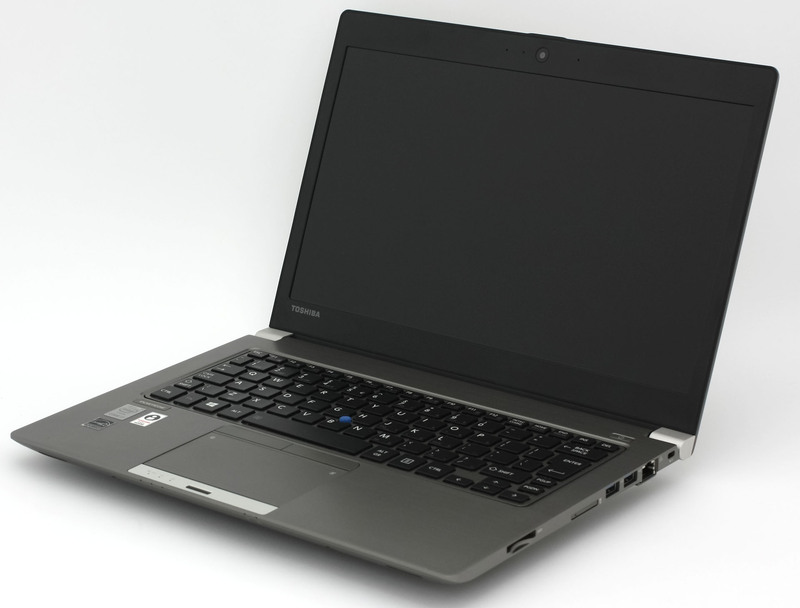 Speaking of data, the notebook is offered with several storage options and the one we have with us is with 512GB mSATA SSD, which will offer relatively fast read and write speeds but not as much as m.2 SATA device. Nonetheless, the mSATA device isn’t the only outdated hardware here – the Core i7-4510U CPU at this price range is quite frankly unacceptable. Fortunately, this applies only for several regions as Toshiba has used mainly Broadwell processors for the refreshed lineup, so be sure to check that out before emptying your wallet. Furthermore, it would be nice to shed some light onto the cooling system. Despite the noisy fan, it turns out that the airflow is enough for the CPU to run almost at its maximum frequency without any overheating. In addition, the CPU fan noise is a fair trade-off when it comes to keeping the outer chassis cool so the user will not feel any heat at all. The display, on the other hand, is just flawless. 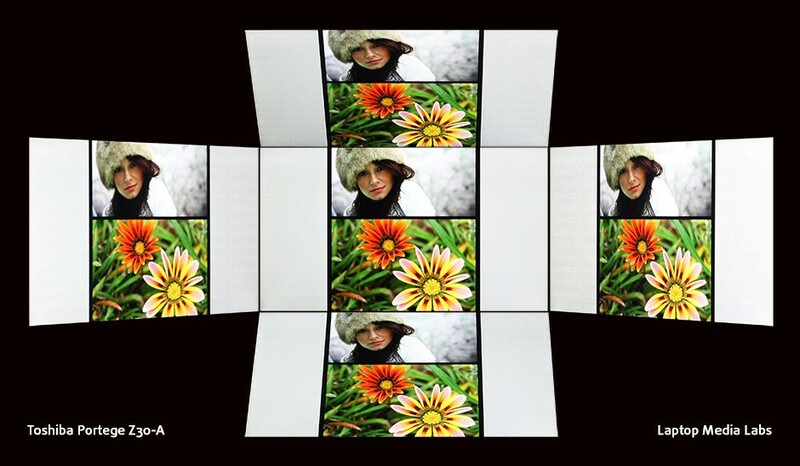 High contrast ratio, high brightness, big color gamut coverage as well as accurate color reproduction are just some of the excellent properties that the panel brings. But the most important thing here is the absence of PWM (screen flickering) over 25% brightness making the display suitable for long hours of work or just viewing multimedia content. 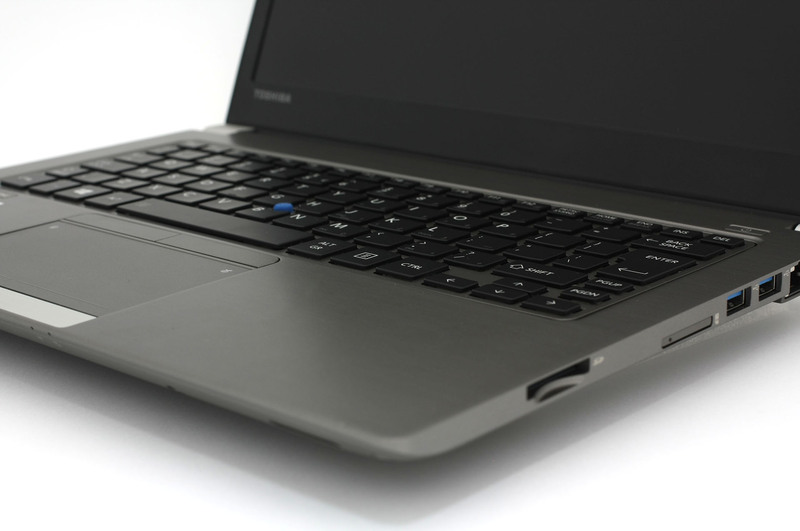 We would like to give our final thoughts on two of the most important factors regarding business-oriented ultrabooks – the keyboard and the battery life. Firstly, the keys are a bit small to make room for the “F” buttons, but this actually isn’t a major problem and it’s easy to get used to it. In addition, the touchpad offers the much-needed comfort, responsiveness, and functionality, but we disliked the trackpad – it’s quite unpleasant to touch and feels awkward to use. Secondly, the battery life appears to be underwhelming. For a small, energy-efficient system a bit better battery performance was expected so in this aspect, the Portege Z30-A left us wanting more. Your reviews are excellent, far more in-depth and comprehensive than most other sites. Can you review the new MacBook and the Surface 3?